The staff room. That mysterious place typically forbidden to students and where teachers can let slide their authoritative personae. Ever wonder what they get up to in there? 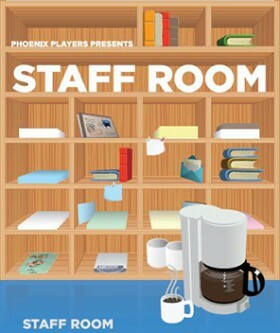 The Phoenix Players’ production of Staff Room endeavours to shed some light on the matter. Boasting over 50 unique characters – played by five men and five women – and 15 different scenes, Staff Room faces the challenge of emphasizing the particularities of each character in a very short time. (A special nod towards Alan Arbuckle and Jonathan Vien is well deserved on this point.) However, they manage to achieve this without much difficulty, providing us with entertaining caricatures, some worthy role models, and even a villain or two. These characters come on and off stage in this almost seamless ebb and flow, the transience of which I actually found to be one of the more interesting aspects of this production. To me, therein lay the verisimilitude to my own staff room experiences, where people would come and go, sharing their drama in the interim, before being replaced by someone else heading on break. On the flip-side of this, however, it means there is very little cohesion throughout this production. The only connection between all of these sketches is the location. Even though there are no subtle signals, each scene is actually taking place at a different time, or possibly even at a different school. You’ll be going from recess breaks to a Saturday morning car wash to an after-school dance without even realizing such a time-shift has taken place. There is no going back after such a shift has taken place either. As soon as a scene has ended, it is never revisited. If there are troubling implications left to contend with, there are no resolutions. Likewise, since there is no connection between the sketches, there is no greater climax being built towards, beyond the minor ones in each scene. While the comedy of this show will certainly get you laughing, it is only a small part of this show’s content. The majority of this play actually deals with a rather more revealing look at the drama and prejudices that exist amongst colleagues. While the harsh opinions that some of these teachers have is something of a reminder that all authority figures are still human, oftentimes the acting gives off the impression of a campy, melodramatic after-school special. However, a common praise for this work is how true to teaching life this performance actually is. Having never really been a part of that realm, it may be that the impact of this performance evades me but would truly hit home with teachers, current or former. That being said, if you enjoyed this play, please share your comments below! I’d be very interested to know what fascinated you about this performance.